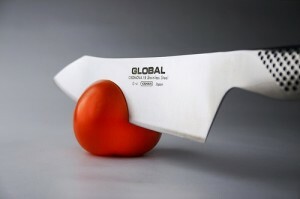 I had a knifing accident the other day – I was attempting to cut an onion using my Global chef’s knife when it slid sideways down the curved surface and took a neat slice out of my finger instead. Without wanting to sound like an infomercial, these knives are renown for their awesome sharpness and one naturally tends to blame the knife for the accident. But if you watch Jamie Oliver or any of the prolific number of cooking shows around, you be familiar with the refrain that it’s blunt knives that hurt people. In my case, if the knife had been sharper it would’ve sliced through the onion, instead of slipping and cutting me. Today’s THRIFTerrific home hint: keep your knives sharp. A quick anecdote: my mum came to visit with us a few weeks ago and cooked for us. She was really impressed with our knives – she commented on how they helped reduce time and effort, but at the same time came away little scared about how dangerous they could potentially be as well. When she got home she decided to replace her cheap, blunt, ancient jobs. For whatever reason a very young sales boy at the department store decided that it’d be a good idea to take one of the knives out of the box and test the blade with his finger, resulting in a bad gash and loads of blood. After a fair amount of fuss, locating band-aids and whatever, he asked my horrified mother whether she was still interested in buying. The outcome of that expedition should come as no surprise, but it’s incidents like these that put people off having the proper equipment. That’s all for this post. Stay sharp, folks!